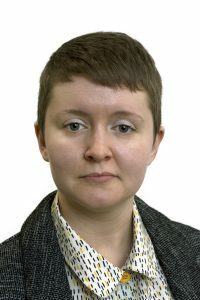 Jenna developed an interest and passion for law, particularly human rights law studying for her first degree in Forensic Anthropology at the University of Dundee. After graduating, Jenna decided to pursue a career in law. She graduated with distinction from Edinburgh Napier University in 2015 with her LLB (Graduate-entry) before completing her Diploma in Professional Legal Practice at the University of Edinburgh in 2016. Throughout her legal studies, Jenna worked part-time in retail, as well as holding a number of volunteer and internship positions. In 2015, Jenna worked alongside fellow law students on the WS Society’s Summer Internship Programme to complete a project on proposed changes to succession law in Scotland. For the past two and a half years, Jenna has volunteered as a Generalist Adviser for a local Citizens Advice Bureau, providing advice on a range of issues, including benefits, debt and employment. Jenna greatly enjoyed working for an organisation that the public relies on and can help inform them of their rights. In order to expand her legal experience, Jenna also interned for a small criminal firm and a local women’s aid charity. Working in her local community strengthened Jenna’s desire and interest to work in social welfare law. Jenna commenced her traineeship with Clan Childlaw in January 2017. She is very excited to be working as a trainee with Clan. She believes passionately in Clan’s mission to improve children and young people’s life chances by using legal skills and expert knowledge to help young people take part in decisions that affect them and by making sure that children’s rights are realised in Scots Law. She is looking forward to developing her project and enhancing access to justice for children and young people in Scotland. While Scotland has made considerable legal and social progress towards equality for LGBT+ people, LGBT+ young people continue to face various challenges and barriers. This includes facing inequality and discrimination across different areas of their lives, such as education, access to opportunities, housing and healthcare on the grounds of their actual or perceived sexual orientation and/or gender identity. There is growing recognition of low rights awareness and engagement with professional services amongst LGBT+ youth. At Clan Childlaw, we understand the importance of young people knowing their rights and being able to access the appropriate information and advice as early as possible. My project seeks to increase access to justice for LGBT+ young people through increasing their awareness and knowledge of their legal rights. I will develop a variety of information resources focusing on legal issues affecting LGBT+ young people. As well as written resources and learning and development resources, we hope to develop, audio-visual and interactive resources and to test the reach and effectiveness of different types of resource. Supported by these resources, I will explore peer education as an approach to improving legal rights awareness. Peer education programmes have been shown to increase young people’s knowledge and skills and allows them to share their own valuable life experiences and knowledge with other young people. The project will aim to develop partnerships and engage in joint actions with LGBT+ organisations and children and young people services operating in Scotland. This will share the resources we develop within the community and will aid in developing peer education work and further our understanding of low rights awareness and engagement with professional services.